One of the keys to advancing more inclusive economies around the world is the empowerment of women. That’s why we at The Rockefeller Foundation apply a gender lens to all of our work, always considering how our programs can create positive impacts for women in their efforts to build more resilient households, communities, and nations, as well as to increase their economic independence. This is, of course, a matter of basic justice, but it’s also a smart cross-cutting investment. There simply isn’t a major global challenge that doesn’t intersect with women and women’s rights: From food security, to poverty, to nutrition, to conservation, to education—we won’t address any of these challenges in a meaningful, lasting way until we even the playing field for women everywhere. The levers we can push to help make this happen are many, and some may surprise you. Yes we need to educate girls, we need ensure women have access to good quality health care, and we need to protect their political rights, but we also need to ensure that their economic rights are protected in law and in practice. And—given that the majority of poor women in the world live in rural areas where land is the most important asset—that must include strengthening women’s rights to land. Currently, we are making great progress, but still falling short, on all of these goals—especially for rural women. As we mark International Rural Women’s Day tomorrow, it behooves us to consider what might be if poor women in rural areas could fully unlock their considerable potential. Perhaps nowhere is this more apparent than in our efforts to close the gap between growing food and feeding people. More women are involved in farming than any other occupation. We know that they perform almost half of agricultural labor. But they have legal rights to just a fraction of the land they rely on to survive. This impacts how they farm and what their families eat. 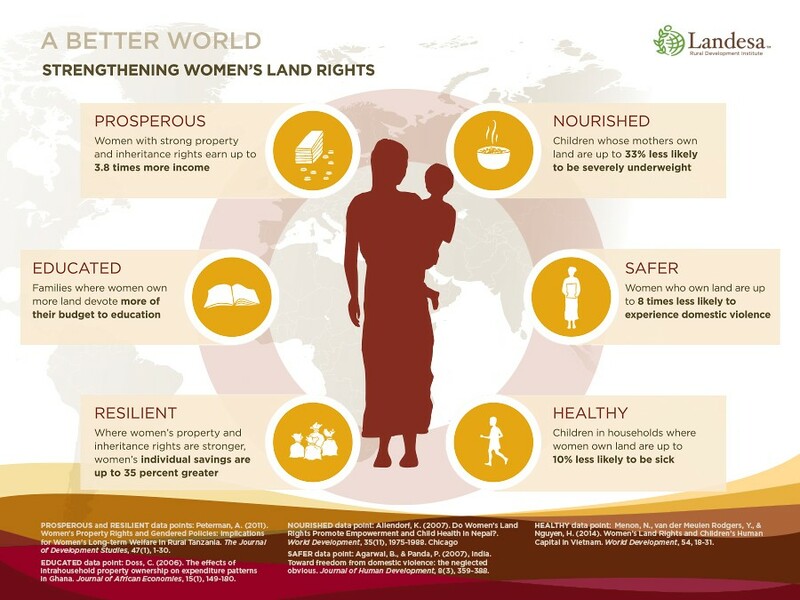 Landesa, a global land rights organization I’ve known for many years, will tell you it is no accident that World Food Day comes immediately after International Rural Women’s Day. Research by Landesa, which was just today awarded the Hilton Humanitarian Prize for its innovative work strengthening land rights for poor rural women and men, illuminates the ripple effect created when women are economically and socially empowered through secure, legal rights to land. The results are cross cutting and breathtaking: when women have land rights, research shows they grow more on their land and their children are 33 percent less likely to be malnourished; they are 8 times less likely to be the victims of domestic violence; and they earn up to four times more income. We know from a wealth of research that women direct more of their income towards their children’s needs than men. They’ll invest in the land and grow more; they’ll become better environmental stewards; and they’ll become more resilient and powerful partners for the development of their families and communities. And we’ll all be better for it.